Thank you “Girlfriends Pray” for posting this. It is so true. Are you going to be a Victim or a Victory? 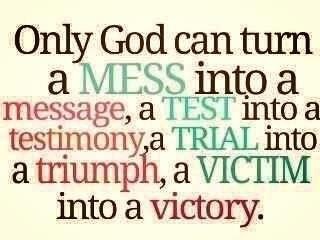 With the Lord, we are all Victorious. I always look at my battles in my life that creates opportunities of change. The change does not always have to include other people but usually it starts with yourself. Since nobody has arrived to be perfect, God uses battles to help develop character and insight. God is the Master Teacher and He will help motivate us in unique ways. I am often reminded of a two scripture in Hebrews 12:11, NLT “No discipline is enjoyable while it is happening — it is painful! But afterward there will be a quiet harvest of right living for those who are trained in this way. 2 Timothy 1:7 NLT “For God has not given us a spirit of fear and timidity, but of power, love, and self-discipline.” Be an Overcomer and Be Victorious!